Since news is some what slow during the offseason, I thought I would start something new and do a review on different baseball books at least once a month. I plan to focus on ones that include indy ball, but I may stray from that every now and then. Finding books strictly about independent baseball isn’t easy. It’s not exactly the most profitable genre of writing, but it is an interesting one. If you have any recommendations for further reviews, please leave a comment! My first book review centers around Chris Coste and his long journey from indy ball to the affiliated minor leagues and finally to the majors and the World Series with the Philadelphia Phillies. 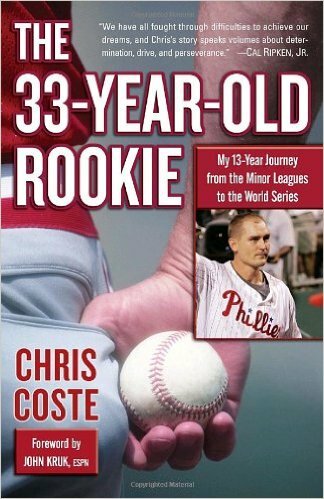 The 33-Year-Old Rookie isn’t Coste’s first attempt at writing a book, but it is a more complete version. In 1997, he wrote a book, Hey… I’m Just the Catcher, that is now out of publication. That book detailed some of his seasons spent in indy ball, but all of that information and much more is now included in his 2008 autobiography, The 33-Year-Old Rookie. As far as indy ball goes, Coste spent five seasons in three different – and now defunct – independent leagues. He spent the first half of 1995 with the Brainerd Bears in the North Central League before the league folded in July. For the rest of the season, he played on the Brandon Grey Owls of the Prairie League. From 1996 to 1999, Coste played for his hometown Fargo-Moorehead Red Hawks with the Northern League. To a lot of casual baseball readers, this is the beginning that leads to the more important parts of his career. For an independent baseball fan, this is the part of the story where you learn exactly who Chris Coste really is. In his four seasons with the Red Hawks, Coste grows as a player and a person. He was originally signed to Fargo-Moorehead, not necessarily based on his talent, but as just the local player to draw fans. However, Coste really grew into his own in those four seasons. He changed positions to wherever he was needed for the team, batted over .300 each season, married the love of his life, had a daughter and took various jobs with the Red Hawks just to keep going. His writing really captures his dreams and his determination. He had a lot going for him with the Red Hawks where he grew comfortable playing and working in his hometown, but one could tell that deep down, he still yearned for something more. That “something more” happened in 2000 when he was signed by the Cleveland Indians and spent a considerable amount of time in Double A Akron and Triple A Buffalo. After two years with the Indians organization, he spent a year with the Red Sox and a year with the Brewers but still never reached the majors. In 2005, he signed a contract with the Phillies organization and played the entire season in Triple A. Then finally, after a stellar spring training performance and a strong start in Triple A, Coste made his major league debut on May 26, 2006 for the Philadelphia Phillies… 11 years after starting his professional baseball career. His journey still wasn’t over. Coste spent time in the minors in 2007 before spending the entire 2008 season in the major leagues. When the Phillies won the World Series that year, Coste became the first player that originated from Division III college baseball’s MIAC to win a World Series. His story is one of grit and determination, ups and downs, victories and failures. It is an inspirational underdog story at its finest, and he manages to capture it perfectly. It is a refreshing read about a truly humble player who worked hard and finally realized his dreams. Coste just loved to play baseball no matter where he was, and that really shines through here. If you’re looking for a book that details the rocky road it takes for a non-prospect type player with true heart and passion to make it to the majors, I highly recommend giving this a read! It’s not as polished as some baseball autobiographies, but that’s what made it so appealing to me. The roller coaster ride, the perseverance, the triumphs… all of it means that much more coming from the guy who lived it every step of the way. Previous PostReekroot – The Social Network That Connects Athletes and CoachesNext PostCamden Riversharks Cease Operations – What Will Happen To Campbell’s Field?